My dear aunt (may God bless her for all eternity) gifted me with a box of delectable Ferrero chocolates for Mother’s Day last weekend. I honestly do not believe that there is a single solitary thing in the known universe that can exactly duplicate the fabulous effects which chocolate has on my mind, body, and soul (although a good bowl of Fettuccine Alfredo does come incredibly close). After a week of running raggedly, a bit of chocolate was just what I needed to relax, refresh, and renew my tired spirit. . . Startled and a little bit confused, I dropped my chocolate back into the box and considered this disturbing situation for a moment. . . I don’t want anyone to get me wrong here, I’m terribly upset about the fact that there are so many children in this country living below poverty levels. And I’d gladly feed a few of them if they asked nicely. But. . .CHOCOLATE?! I know I’m not one to talk about starvation. I get my 12 square (and sometimes octagonal) meals a day, and I could go for a good month or two before anything remotely resembling starvation even thought twice about glancing my way. . .but still – CHOCOLATE!? Aren’t we sending the wrong message here? Maybe we should give ‘em an apple, or some bread and cheese? Maybe a vegetable or two? I’d even spring for a burger. But they can NOT have my chocolate! He did. Of course, they were newlyweds at the time, and he would have turned the moon to chocolate if it would please her, and so his life’s mission began. 15 years and several hundred pounds of chocolate later, she might not be quite as alluring as she was on that fateful day, but that has nothing to do with this. . .THIS is about starving children. And despite the fact that dark chocolate has been shown to have so many wonderful and healing properties (any momma could have told him that the stuff is made of magic, but of course you can’t prove that kind of thing), it still has not quite been shown to replace a balanced meal or two. So then I got to thinking about things, and from what I’ve seen and read recently, I was under the impression that obesity was the big problem facing the youth of the good ol’ US of A, not starvation. According to my in-depth 10 minute Google studies, somewhere around 25% of American kids under 19 years old are overweight or obese, which is horrible. And about 17% of children are hungry, which is even worse. And like I said, I’m all for helping the little devils get a bite to eat, but we really don’t want the hungry 17% joining the ranks of the 25% overweight simply because they had too many chocolates. Admittedly, I’m not very good at math, but with my rudimentary skills, I’m getting a number somewhere around 42%. Which I believe is nearly half. And if nearly half of the country’s children are overweight, then my little girl will get the crap kicked out of her in elementary school by bullies. Really, really BIG bullies. Plus, chocolate has caffeine and sugar in it. Caffeine and sugar are both addictive (and thats not even bringing the magical properties of chocolate into the matter). Eventually, a piece or 3 of chocolate won’t be enough to satisfy their cravings anymore, and they’ll need more. As these chocolate-munching addicts grow older, their addictions will grow with them, and by the time they join the ranks of the adult world, with little baby super-addicted hyper-active chocolate munchers all their own, there will be a world-wide chocolate shortage. Rioting in the streets will follow, and eventually, the end of the world. . . a sad and sorry world with not one bit of chocolate still left in it. And I’m just not down with all that. Although I appreciate what the Ferrero Chocolate company is trying to do for our underprivileged youth, this is not the way to go about it. That said, eating chocolate is far better than eating nothing at all, and we can’t let these poor little children go hungry. . .There must be a solution to this rapidly growing crisis. I strongly encourage all of you, my nonexistent readers, to do the same. Together, we can make a difference. Together, we can save the world. . .
Additionally, I’ve made the decision to eat my entire box of Ferrero chocolates. Every single last one. And I won’t share even a crumb with any children, starving or otherwise, including my own. . .but if they ask nicely, I’ll let them have an apple instead. 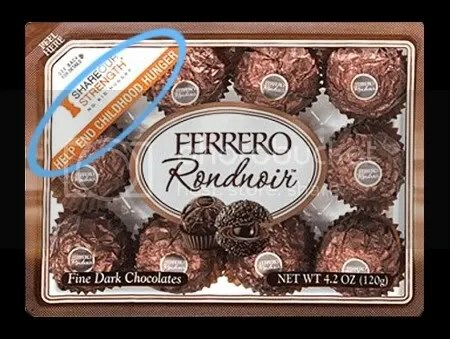 DISCLAIMER: Ferrero Chocolates has joined forces with Share Our Strength, a non-profit organization created to eradicate the terrible epidemic of childhood hunger. They have donated a lot of money to this wonderful cause and to date have not given any chocolate to starving children that I know of. This is a good thing all-around! Visit Strength.org to find out how you can get involved with this noble cause and help bring food to the needy. Every bit counts, and they are all about apples! are you happy? do you know it? learn when to clap your hands.